Our Greetings Cards are available in a choice of Square, A6 or A5 sizes, printed in full colour inside and out onto high quality 400gsm Silk card. Finished with an optional luxury Gloss Lamination to the outer, creased and supplied flat with white self-seal envelopes. Whether moving address, celebrating seasonal festivities, or thanking your client base for their custom, you can make your message extra special with an affordable branded Greetings Card. Impress your clients with traditional 'Merry Christmas' and 'Happy New Year' wishes. We can print any design inside and out, leaving you to add a hand written personalised message, or we can print a generic message for you. We also print cards for Artists and Illustrators who then sell on at exhibitions and local events. 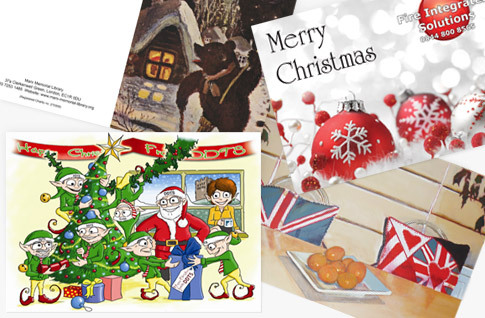 We offer a professional and cost effective in-house design service; if you do not have print ready artwork and would like us to design your Greetings Cards. The set price and option to add this service to your order will be displayed at the bottom of the pricing table.